Matthew McConaughey as Ron Woodroof in Jean-Marc Vallée’s fact-based drama, DALLAS BUYERS CLUB. ©Focus Features. CR: Anne Marie Fox. “They say we only use 10 percent or our brain so there’s a 90 percent well of reserve that we haven’t even tapped into,” says the tall Texan, once dubbed The Sexiest Man Alive by People magazine, in his distinctive drawl. Though handsome actor says he felt like he was getting smarter as he lost weight, his physical stamina diminished dramatically during the months leading up to the start of the film’s production. He grew too weak to play outdoor sports—and McConaughey is a naturally athletic guy. The “Ron” he is referring to is Ron Woodroof, a Texas rodeo cowboy and electrician, who was diagnosed with HIV in 1985. His story is the subject of “Dallas Buyers Club,” directed by Canadian Jean-Marc Vallee from a script by Craig Borten and Melisa Wallack. HIV and AIDS already had ravaged the nation’s gay community by the mid-‘80s, but like so many uninformed Americans, Woodroof considered AIDS a “gay disease,” and couldn’t understand how he, a heterosexual, could contract it. At the time of his diagnosis, he was given only a month to live. Instead of accepting his fate, Woodroof began researching experimental treatments, which led him to an AIDS clinic south of the border. There he found medicine unavailable in the U.S. As he started to respond positively to the treatment, he had an entrepreneurial idea: smuggle the drugs across the border to sell back home in Texas on the black market. His little business, which he called a “buyers club”, so as not to arouse the suspicion of local and federal law enforcement, became quite successful. The one-time bigoted homophobe began to embrace the gay community, which was ostracized by the mainstream public because of the disease. While the filmmakers took some dramatic license with Woodroof’s real story, the main details about his life after his diagnosis, are intact. (He succumbed to complications from AIDS in 1992, seven years longer than expected.) “Alias” star Jennifer Garner plays his doctor and Jared Leto (of “Requiem for a Dream” fame) transforms himself into an HIV-infected transvestite that Woodroof befriends. McConaughey says he was onboard with the project when it came his way a few years ago, even though he had plenty of other work to keep him busy. While the tabloids speculated on McConaughey’s health as paparazzi snapped candid photos of the actor in his emaciated state, the actor says his family knew what was going on and were fine with it. The 43-year-old is married to Brazilian model Camila Alves with whom he has three young children—Levi, 5, Vida, 3 and Livingston, 1. They spend most of their time in Austin, Texas. 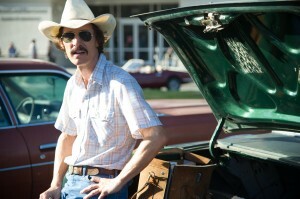 McConaughey’s career began 20 years ago when he was discovered by filmmaker Richard Linklater, who cast him in the drug comedy “Dazed and Confused.” Since then, he has appeared in more than 40 feature films that have grossed a combined $1 billion worldwide. Always a bit of an outsider and a free-thinker, McConaughey’s most bizarre moment came in 1999, with his arrested for pot possession at his Austin home, after a neighbor called in a complaint about loud noise coming from his house. Police discovered the actor naked playing the bongos. He was absolved of the possession charge but cited for disturbing the peace. He pleaded guilty and paid a $50 fine. Since his 2005 marriage, McConaughey seems have adopted a more constructive path. He has put his efforts to philanthropic endeavors, including animal rescue and establishing his jkl (Just Keep Livin’) Foundation, which serves underprivileged children through programs that teach the importance of decision-making, health, education and sports. He remains an in-demand actor, having starred with Channing Tatum in the hit “Magic Mike,” last year (which earned him a Spirit Award for his portrayal of a male stripper turned club owner. This year, he starred in Jeff Nichols’ indie drama, “Mud,” which was a sleeper hit. He co-stars with Leonardo DiCaprio in Martin Scorsese’s “The Wolf of Wall Street,” due out Nov. 15. Next year, movie audiences can catch him in alongside Woody Harrelson in the HBO dramatic series “True Detective.” He currently is filming Christopher Nolan’s “Interstellar,” set for release next November. 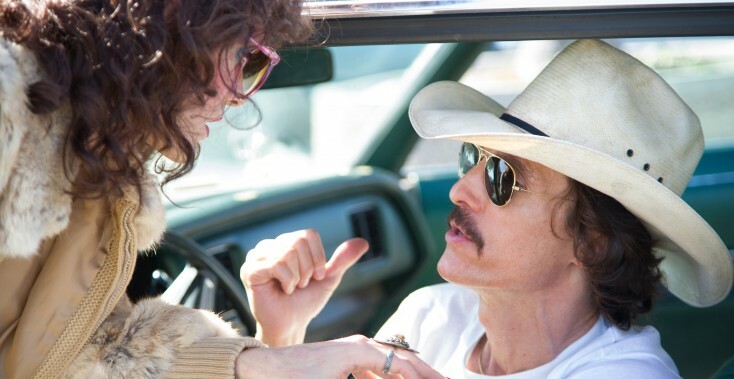 Though McConaughey never met the man he depicts in “Dallas Buyers Club,” he feels he learned something from researching the fellow Texan.